The original track was opened by the Monmouth Park Association on July 30, 1870 in Long Branch, New Jersey. It was later bought by David D. Withers, George L. Lorillard, James Gordon Bennett, Jr., and George P. Wetmore after which Withers ran the facility for more than a decade during which time he helped found racings Board of Control, a predecessor to The Jockey Club. From 1882 to 1890, the track increased in popularity, but legislation proposed in 1891 and enacted in 1894 barred parimutuel betting in New Jersey, and the track closed its doors. In May 1894, the Township Committee at Eatontown, New Jersey ordered the seizure and sale of the Monmouth Park Association's grandstand and other property for the payment of back taxes and on May 7 was sold at a public auction. Some of the major races held at the Long Branch track included the Champion Stakes, the Freehold Stakes, and the Monmouth Cup. 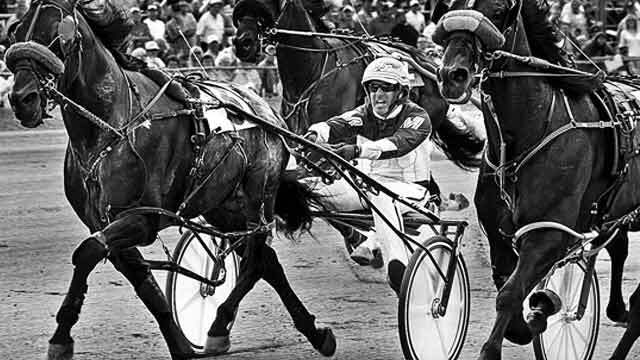 In 1946, the New Jersey Legislature passed a bill providing for state regulation of horse racing. Spurred on by Amory L. Haskell, who led the legislative charge to once again permit wagering on horse racing in New Jersey and Philip H. Iselin, a New York City textile magnate, along with the backing of Reeve Schley, Joseph M. Roebling, John M. MacDonald, Townsend B. Martin, and James Cox Brady, Jr., the new Monmouth Park (organized as the Monmouth Park Jockey Club) opened on June 19, 1946 after a 53-year hiatus with 18,724 in attendance. The New Jersey Sports and Exposition Authority purchased Monmouth Park from its previous owners, the Monmouth Park Jockey Club, in 1985, in a deal valued at $45 million. The NJSEA still retains the corporate name "Monmouth Park Jockey Club". The Vans Warped Tour, a touring music and extreme sports festival, is held annually at the racetrack. Monmouth Park marks the New York stop on the nation-wide tour, which visits the area during July. In 2011, a five-year lease was signed with Morris Bailey, co-owner of Resorts Casino Hotel in Atlantic City, to provide a marketing partnership between the casino and racetrack. The agreement allowed Resorts to sponsor the Haskell Invitational, and possibilities include a merging of loyalty programs as well as bringing entertainers' appearances at the casino to the racetrack. The program is part of a strategy to mesh horse racing with casino gambling. The main track is a one mile (1.6 km) dirt oval with chutes for 6 furlong and 1-1/4 mile races. The turf course is seven furlongs in circumference, with a diagonal chute for races between 1-mile (1.6 km) and 1-1/8 miles. A re-design of the grass course for the 2006 season brought with it a new, second chute to accommodate 5-1/2 furlong sprint races. Turf races can be run along the hedge, or with the portable rail out 12 feet (dubbed the "Haskell Course"), 24 feet ("Monmouth Course") or 36 feet ("Lennox Course"). The Stable Area, located directly to the north of the back stretch of the main track, contains a total of forty barns and stables, twelve north of the New Jersey Transit's North Jersey Coast Line (connected by its own service and access road) and twenty eight on the main complex. The Wolf Hill Farm, which served Monmouth Park as a private stable and practice facility, is located adjacent to and immediately west of the main complex. Wolf Hill, owned and operated by the Valentino Family from the nearby City of Long Branch, New Jersey featured barns, stables and a practice track featuring a dirt oval and turf course identical to that at Monmouth Park's main facility only built to 50% scale. The Valentino Family sold Wolf Hill Farm to the Monmouth Park Jockey Club in 1963 which then became part of the greater Monmouth Park Complex. It was transferred to state ownership in the 1986 takeover by the NJSEA and was eventually sold to the Monmouth County Park System in 1998 which now operates the site as a passive recreation park. While Wolf Hill ceased operating as a farm following the 1963 sale, owners and trainers continued to use Wolf Hill's practice track well into the 1990s. Remnants of the practice were clearly visible on the site until after the 2009 meet. After the 2009 meet, construction began in the Wolf Hill area, eliminating the last of the practice track. with chutes for 5 & 5.5F races, and 1-1/16 & 1-1/8 races.